(Top) Harriette Adams at Seven Cedars Casino, (Bottom) Adams Home in Jamestown. 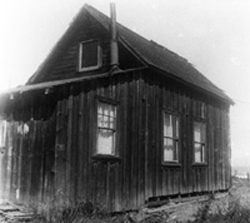 Harriette was born in her parent’s house in a village consisting of a few Indian houses on Dungeness Spit. She was delivered by midwife, Ida Balch Hall, who was her aunt. Later the house was moved and floated on a log raft to Jamestown known at that time as “Jimtown” but they never lived in this house. Her mother died when she was two years old. She also had two sisters who died young. Eleanor died at age nine and Helen was one day old when she died. Crab were plentiful in those days. Harriette liked to go crabbing with her father. “Jake,” as he was known, made a living as a crab fisherman between Dungeness and Jamestown. He built an eighteen foot cedar boat named “Diablo” that had an inboard motor. Jake also built his own traps made of wood with eighteen gauge wire. He used clams for bait and held the trap down in the water with a brick. “Our people did their fishing on Cooper Creek. They gaffed them,” Harriette says. They fished for salmon in this creek. Cooper Creek is located west of Jamestown where the Three Crabs Road now ends. Clams could be dug on the beach at what is now known as the Graysmarsh Beach at Jamestown. When Harriette went berry picking she gathered wild strawberries, thimble berries and blackberry sprouts. They would peel the skin off and then eat them. Harriette attended the Jamestown Day School. 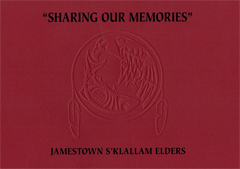 The first of three schools was built at Jamestown in 1878 and when the last one burned down the children were transferred to the Sequim school in 1934. 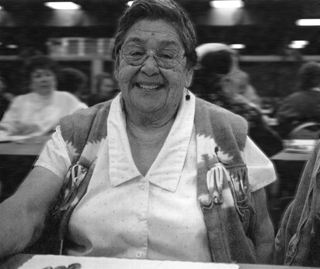 She and Margie Collier were the first Indian women to graduate from Sequim High School. Later in life she did custodial work in the school. Harriette went to the Shaker Church in Jamestown where her great-uncle Billy Hall was the main Shaker minister. He was the last Shaker minister there because people chose other religions. Harriette Hall Adams passed away in 2009.